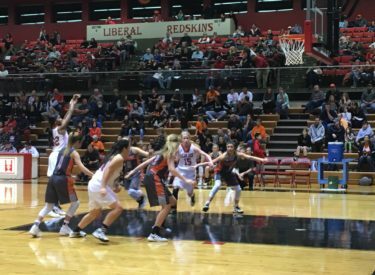 Ready to create their own Big House magic, the Liberal Lady Redskins crushed Holcomb 53-23 Friday night in front of a large crowd in the Big House. LHS started two freshmen and a sophomore on opening night. Freshman Machia Mullens led Liberal with 17 while senior Jada Mickens had 13. The was a 5-5 tie in the opening minutes before the Lady Skins went on a 20-0 run and would lead 34-11 at the half. LHS led 48-16 and 50-18 on their way to the 30 point win. The Lady Skins only made one three pointer (Whitney Hay) but they were able to take high percentage shots inside. The 1-0 Lady Skins win the opener for the second straight season. They play at Guymon for Guymon’s opener at 6:30 Tuesday airing on 1270 and kscbnews.net.